Many vestiges of World War II in the Pacific linger, denying the ravages of time. The battleship USS Missouri, where the war ended nearly 70 years ago, remains as a floating monument and museum at Pearl Harbor in Hawaii. Not far away, the rusting hulk of the battleship USS Arizona, sunk during the Japanese attack on Pearl Harbor that plunged the United States into World War II, rests in its shallow grave. Nearby, craters left by Japanese bombs, bullet holes from machine guns, and damaged concrete walls remind visitors of that violent day so long ago. 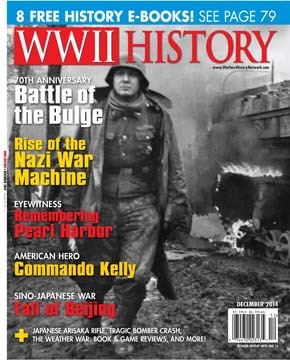 December 2014 issue of WWII History Magazine. On other islands, rusting tanks, long abandoned guns, the wreckage of aircraft that plunged into jungles, and the remains of honeycombed caves that the defenders of Iwo Jima lived and died in remain as mute testimony to the ferocity of the fighting. A Japanese ghost fleet, sunk during American air raids, lies submerged in the harbor of Truk atoll in the Caroline Islands. Most of these vessels still hold their cargoes of fuel, ammunition, and weapons. From time to time the remains of Japanese and American fighting men have been recovered. The repatriation of skeletal remains or their ceremonial cremation and interment have been the subject of widespread media coverage. Today, on the island of Saipan in the Marianas, the scene of savage fighting during the summer of 1944, a race against time is underway. Members of Kuentai-USA, a nonprofit organization that searches Pacific islands for the remains of Japanese war dead, has been consulting archives in the United States recently. The Japanese are looking for clues, information, evidence, anything that might point them toward the graves of American soldiers who died on Saipan during the war, were buried there, and then through the confusion and shuffle that followed the fighting were forgotten. These are a handful of the thousands of U.S. soldiers, sailors, and Marines listed as missing in action. Usan Kurata, the 58-year-old founder of Kuenti-USA and a journalist by trade, told the Associated Press recently, “This is urgent.” Kurata and others from the organization were searching through records at the New York State Military Museum when the interview was conducted. Kurata told the wire service that the members of Kuenti-USA believe returning the remains of the missing Americans of Saipan to their families is the right thing to do. Kuenti, a Japanese organization, has previously used maps and photographs that were taken in 1944 and appeared in Life magazine to locate a mass grave holding 800 Japanese dead. Why the urgency now? A Russian real estate developer has announced plans to construct a condominium development on Saipan in close proximity to the beach where a number of Americans lost their lives on July 7, 1944, defending against the largest Japanese banzai attack of World War II. On that night, more than 3,000 Japanese troops attacked positions held by the 105th Infantry Regiment, 27th Division, a New York National Guard unit, and more than 900 Americans were killed or wounded. Since 2011, Kuenti personnel have found the remains of two American dead near the proposed construction site, and they have reason to believe that as many as 16 others are buried in the area. According to the Pentagon, 20 American casualties remain missing on Saipan, and a spokesperson for the U.S. Joint POW-MIA Accounting Command (JPAC) has promised that a recovery team will be sent to Saipan if a probable burial site is threatened by commercial development. There are also strict building guidelines that developers are required to follow. So many years after the life and death struggle for Saipan and other Pacific islands, the effort to locate the missing, both American and Japanese, continues. Hopefully, reforms and renewed accountability in JPAC and the Defense POW-MIA Office will bring additional energy to the ongoing search. Tags Battle of Saipan, battleship, Iwo Jima, Japan, Marines, Pearl Harbor, POW, Saipan, The Pacific, United States.